Plug and play installation on 2010-2012 Harley-Davidson® Street Glide® CVO™, 2009 Road Glide® CVO™, 2012-2013 Road Glide® Custom CVO™ and 2013 Road King® CVO™ applies brake flash/strobe pattern to OEM LED panel run, brake, and turn signals..
Use our Magic Strobes™ SS6 for 2010-2013 Street Glide® and Road Glide® Custom (non-CVO). Magic Strobes™ HD available for 2006-2009 Street Glide® and Road Glide® Models. 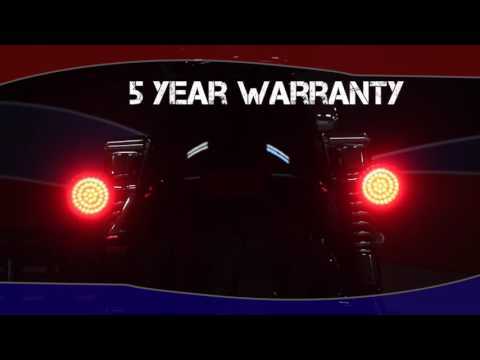 Use our Magic Strobes™ RSG for 2014-2018 Street Glide®, Street Glide® Special, Road Glide®, Road Glide® Special or use our Magic Strobes™ BCM for 2014-2018 Street Glide® CVO™, Road Glide® CVO™, and Road King® CVO™. Riders can easily select from 10 flash/strobe patterns by simply spinning the dial on the Magic Strobes™ Brake Light Flasher module! It has a sleek design and compact dimensions: 2.25" X 1.25" X 0.5". Plug and play installation on 2010-2012 Harley-Davidson® Street Glide® CVO™, 2009 Road Glide® CVO™, 2012-2013 Road Glide® Custom CVO™ and 2013 Road King® CVO™ applies brake flash/strobe pattern to OEM LED panel run, brake, and turn signals. Use our Magic Strobes™ SS6 for 2010-2013 Street Glide® and Road Glide® Custom (non-CVO). Magic Strobes™ HD available for 2006-2009 Street Glide® and Road Glide® Models.